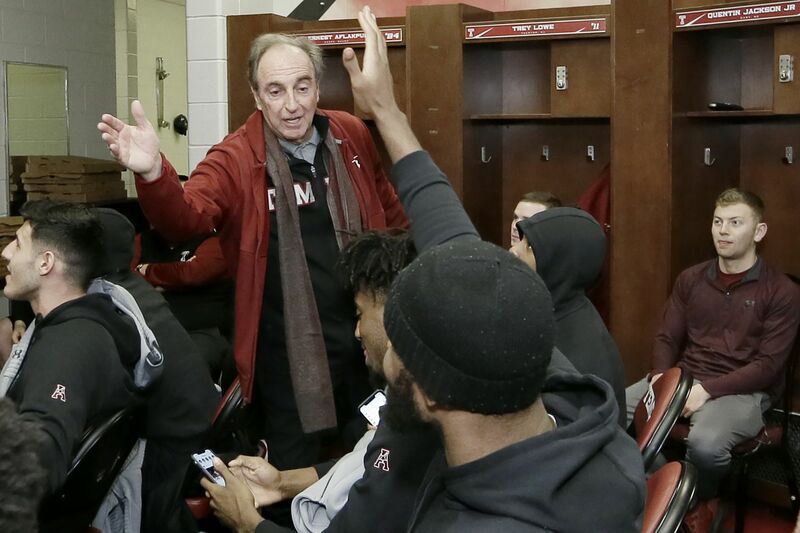 Temple head coach Fran Dunphy high-fives members of the Temple team shortly after learning they were being included in the NCAA Tournament. The crowd at Monday’s Coaches vs. Cancer breakfast was on its feet, applauding Fran Dunphy out of the Palestra, staying on its feet as he disappeared up the Southeast ramp. This was his crowd, his people. Certainly Temple’s rooting section this week. Temple people? Some. Penn folks? Sure, the Quakers were represented. … But, no, this was more the full spectrum of the Philadelphia basketball community. If I heard it once Monday morning, I heard it from 50 people — their rooting interest this week, the Owls. The reason? The guy who had just left the building. The savvy ones weren’t saying it will be easy. Belmont is Temple’s NCAA play-in opponent Tuesday in Dayton. Belmont is a slight favorite for a reason, its precision offense built to give unaware defenders fits. There was no big send-off for Dunphy from this Coaches vs. Cancer organization that Dunphy and Phil Martelli lifted locally into the biggest chapter fundraiser in the country, because Dunphy threw water on all attempts. “I just want to say … it might be even better that he’s not here,’’ said Jay Wright, next up to speak on the dais after Dunphy left early to join his team, before Wright offered his personal praises. It’s a fairly open secret within Philadelphia basketball that Fran Dunphy represents the heart of it, with connections to every last local hoop strand. Detractors say, “He’s a nice guy.” Nah, they’ve somehow missed it all these years. The term role model gets thrown around too much. Dunphy is just the guy the others emulate. This season, by the way, might have been the best coaching job. Not talking about wins or losses, Xs or Os, seedings or rankings. The deal was done that made this Dunphy’s last season at Temple. That was the school’s right. He’s made good money and the last couple of teams hadn’t made the NCAA Tournament and the crowds had been thinning. But coach another season, then have the assistant take the reins — you don’t see that. Others might have told their school to pound sand, or have their attorney negotiate a suitable buyout of the three years remaining on the contract. Dunphy’s approach: He all but ignored the fact that this was his last season, telling everyone from the start he’d treat this one like any other. “I don’t think anyone could have handled it better,’’ said Penn coach Steve Donahue, Dunphy’s former assistant. Fran Dunphy clapping during his team's January game against Memphis. Maybe it was right in Dunphy’s wheelhouse. Find some guys who are into ball, ride them hard, keep it about what’s right in front of them. As Temple prepares for Belmont, let’s argue this was kind of a quintessential Fran Dunphy team. He gave the ball to a tough talented player, Shizz Alston, a veteran who delivered. All the old Dunphy players nodded their heads seeing that in action, a guy who probably didn’t love his role as a freshman turning into the hardened centerpiece by the end. Temple didn’t get into the NCAA Tournament solely because of its 23 wins. Really, it was the lack of bad losses that secured the bid. Not losing the games you should not lose, a Dunphy career trademark. They did throw out some big-time clunkers, Temple fans will tell you. They blew the Cincinnati game badly, I’ll tell you. A quintessential Dunphy team doesn’t necessarily offer beautiful offense. He won’t even claim this as one of their better defensive teams. But if Temple somehow manages to grab a late lead, the ball will be in Alston’s hands, and the Owls were 9-2 this season in games decided by five or fewer points, 4-0 in overtime games. "Coach’s coach,'' Lappas said, over by the coffee line. The debts others feel for him are real. Drexel coach Zach Spiker said he isn’t sure what kind of career he would have had if Dunphy hadn’t hired Donahue as a volunteer coach at Penn, and Donahue hadn’t hired Spiker as a volunteer coach at Cornell. “I never worked a day for Coach Dunphy, but he was a pretty unique influence for me,’’ Spiker said Monday at the breakfast. If all this puts me in the tank for Dunphy: Sure, guilty, throw away the key. There’s no way around the fact his teams haven’t done much of anything in the NCAA Tournament. Maybe his X and O approach really wasn’t built for March. There’s one last chance to prove that wrong. His style was certainly built for the rest of the months for three decades. “Eh, uh …” Dunphy said when cornered, adding that’s not for him to decide.